Tirana capital of Albania, is one of bigger Balkans cities. Given the distance of Albanian border from Podgorica (28 km), taxi from Podgorica airport to Tirana Albania is often request of our customers. The total length of the border between Montenegro and Albania is more than 200 kilometers, but unfortunately there is no organized transportation from Podgorica, Montenegro to Tirana Albania. Only during the summer tourist season, there are organized bus transport from Ulcinj to Albania, but these are mostly pre-contracted seasonal lines. There is also a railway transport between Podgorica and Shkodra, but only for freight traffic, passenger was never established. Transfer from airport Podgorica to Tirana is usualy business trip at the price of 120 Euros per a cab, but also we have a requests of passengers which are traveling to northwest part of Albania (Koplik, Shkoder, Velipoje, Puka, etc). If you need to reach the airport, you will pay in total 100 Euros. Because of this, taxi from Podgorica Montenegro, or Podgorica airport to Tirana, or to other cities in Albania, Shkoder, Durres, Sarande is the only mode of transport. With starting point Podgorica, using border crossing Božaj, the first major city in Albania is Shkoder. The ride continues to the town of Liezh, and then follow Tirana. 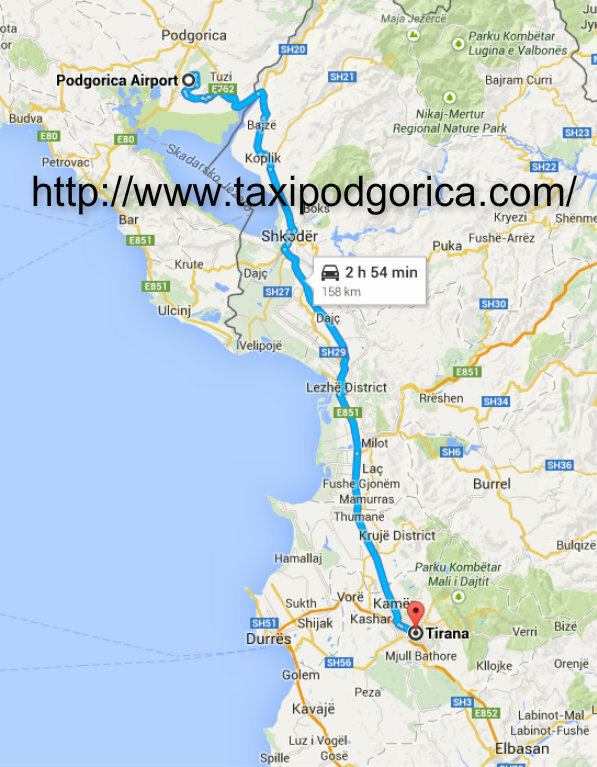 Taxi transfer from Podgorica airport to Tirana is providing by same route. Retentions on the border crossing are not big, and the citizens of Montenegro and Albania are crossing the border just with ID. Distance from Podgorica airport to Tirana is about 175 km, and transfer from Podgorica usually takes 2 hours and 45 minutes. The road is relatively good, and the entire length of the ride is through the flat part, which mean that travel to Tirana is very commfortable. 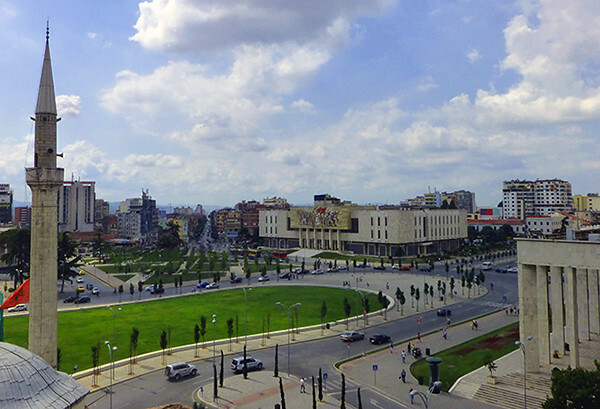 If you are going to Tirana for the first time read here more about Tirana. We are also providing transportation from all other cities of Montenegro, to any destination in Albania. Using our service you can get taxi transfers from Budva, Kotor to Tirana, Shkodra or to any other resort in Albania. Taxi from Podgorica airport to Tirana Albania is carried out only by licensed taxi drivers, who drive new and comfortable taxis, adjusted for longer trips. All our vehicles are Mercedes E class or Volkswagen Passat. All kind of taxi transportation from Montenegro to Albania can be scheduled in advance by phone, mail, or through our contact form. Also if you are coming to Montenegro over the Tirana airport, you can contact us for a service taxi from Tirana airport to Podgorica Montenegro. Book in advance your cheap taxi from Podgorica airport to Tirana Albania, and our taxi driver will wait for you at the airport exit, holding a board with your name. Transportation from Podgorica to Tirana cost 120 eur, and taxi from Podgorica to Tirana airport is 100 eur, and these are prices per vehicle, 1-4 persons.